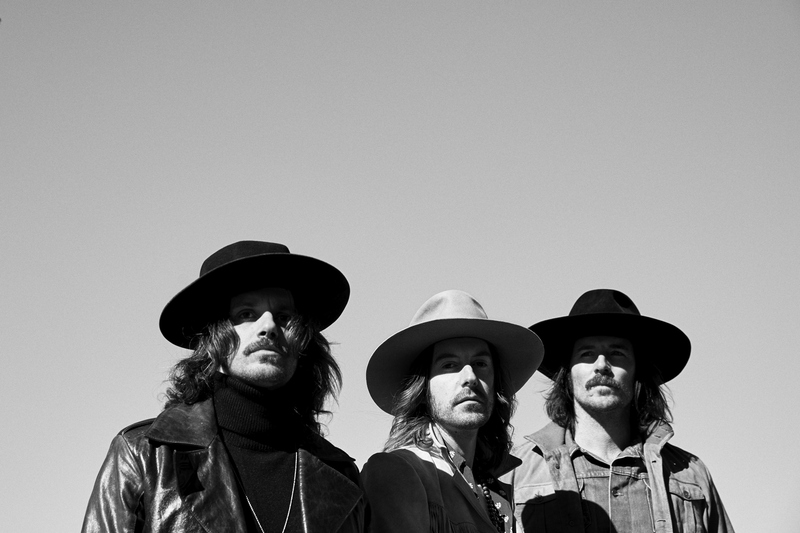 They were one of the highlights at Country 2 Country 2018 and now Midland are ending the year on a high here in the UK with their first headline tour a complete sell out. Last night, they stopped off at Gorilla in Manchester to perform to a packed and raucous crowd. They delivered a stunning set, full of energy and rabid enthusiasm. It is one of the most intense country gigs I’ve experienced this year. Before the trio stepped out on stage however, another rebel-rousing country singer came on to warm up the crowd. A long-time friend of Midland (he was also their tour manager for 18 months until recently), the bearded and flat-capped Desure ensured that the night got off to an electrifying start. The audience were drawn forward, their noise levels muted, as soon as he began his set. He held them captive throughout, with a voice cut from the same cloth as David Gray and a musical style surely influenced by Bob Dylan. Songs ‘Kick Rocks’ and ‘Los Angeles’ were the highlights in a tremendous half hour of dark and whimsical storytelling. Finishing with the toe-tapping crowd pleaser ‘Forever Be Mine’, this rough-and-ready talent set us up nicely for the main event. Midland sure know how to build anticipation among their fans. With a synthesiser resonating ever more loudly around the room as the lights slowly dimmed, the excitement became ever more palpable. It finally exploded into full-blown singing as a reworking of ‘Take Me Home, Country Roads’ suddenly began. Its resolute ending sent the audience into hysterical clapping, evolving into wild screams as Mark, Cameron and Jess took to the stage. Taking advantage of the hyped-up atmosphere, they began with the crowd-pleasing song ‘Check Cashin’ Country’. Not wanting to expend all the energy in the room too early, they then slowed down the pace with ‘Burn Out’ and ‘Electric Rodeo’. The red lighting that accompanied both songs added to their ambient tone, and helped to bring the audience down to a more sedate level before things really kicked off. ‘The Gator Boys’ pushed the noise levels up again, Cameron getting caught up in the wild reception of the audience so much that he temporarily forgot the lyrics, much to the amusement of his fellow band members. We were then treated to a new song from their still-in-progress second album. ‘21st Century Honky-Tonk’ was a beautiful bluesy number that led seamlessly into ‘Fourteen Gears’, the band’s first-ever release. Mark ended the song with a nod to Alan Jackson. Covers of Springsteen and the Rolling Stones followed. Before ‘Altitude Adjustment’, Mark prescribed John Denver to anyone having a bad day, year, or even a bad life. The trio are clearly rich in terms of musical influences; their brand of honky-tonk brings together a host of genres that are infused with old style country and western as well as a whole lot of soul. Midland ended their main set with the crowd-favourite ‘Make a Little’. Throughout, the band revelled in guitar solos and instrumentals. And it was at its peak here. After bowing out stupendously with a rip-roaring cacophony of electric, bass and acoustic, they returned to the stage for an almighty encore. ‘Drinking Problem’ was something of a hymn for this Friday night congregation, who belted out the chorus with gusto, their hands held high and beer glasses in the air. It was only the 10pm curfew that stopped the band from carrying on. They had time to just squeeze in what I believe was Don Williams’ ‘Falling in Love Again’ to end an electrifying night on a graceful note. If you can catch Midland live, it is worth every penny. They are entertainers as well as fabulous songwriters and musicians. The future is looking ever brighter for these Texas cowboys.